Thinking about Hokkaido but afraid it’s too far? Well, the true is, it is far but it’s worth it! Let me tell you our story, and then re-think it again J. Because of the quite expensive travel cost in Japan we chose to use Seishin 18 Kippu (you can find about it under ?Useful info“ on Kikuko’s website). It took us 2 days to reach Hokkaido, but we stopped in Tokyo and Matsushima as well. From Nagoya we took an overnight rapid train to Tokyo to get the most from the ticket. The train leaves before midnight so the trick is to buy the regular ticket to Anjou; the train arrives there right after midnight so from there you use your seshun 18 kippu (2300Yen and you still have 24 hours to go!). We arrived to Tokyo very early in the morning, and after hanging around for some time we visited the Tokyo Imperial Gardens (opened from 9am, some nice pictures are on http://www.nd.edu/~sboker/PhotoBlogs/Japan/Tokyo2003a.html, or info http://www.japan-guide.com/e/e3018.html). Then we continued north and after few transfers we arrived to Sendai, around 4-5pm. Since our next destination was Matsushima we passed by station tourist information to pick up some pamphlets to see what is interesting in the area. Equipped with tent, we took a local train to get out of the city and camped in the countryside. Next day we were lucky to hitch-hike nice couple that took us to see local nature sceneries (waterfalls, canyons,..) and in the evening they dropped us in Matsushima. The next stop was Sapporo, by overnight (luckily direct J) train. Sapporo is the capital of Hokkaido and the fifth biggest city in Japan (almost 2 mil. people). It has very pleasant atmosphere, some kind of mixture of an international “fuinki” and Japanese beauty (more about the city - http://www.conventionsapporo.jp/why/why.html). nice pics are here http://www.heather-and-albert.com/sapporo_ii.htm...). Our next train heading to Wakkanai took us trough Asahikawa, second biggest city in Hokkaido. It was our third Seshun 18 kippu and we wanted to arrive there within the day. But it became obvious we could not catch the Wakkanai before midnight ? the expiration of our 18kippu (Hokkaido is very scarcely populated so the train service is much less frequent than in Honshu). So after quick consultation just few hours away from Wakkanai we decided to upgrade to an express train. It took only 3 or 4 hours but at the station we had to spend half an hour negotiating with the station master J. Another option was to pay 4000yen express surcharge but we managed to avoid it J.
in summer for bikers, cyclists and even caravans. It has nice road infrastructure with well maintained “michi-no-eki” net (highway rest areas). More than rice field you will see corn or potato fields and it is not rare to see dear, fox or other wild animal close to road, or human dwellings….Hokkaido holds also country’s record in low temperature, -56℃. People seem to be much more relaxed and less stressed than in the Honshu and it is very easy to hitch-hike there (though we never had a problem in Honshu either J). Back to Wakkanai. It is a typical port-fishing city. Wide streets, again very peaceful atmosphere and very good soft cream J. We camped under Wakkanai Dome, very close to a ferry port and approx. 300m away from train station (see http://www.alternative-tourism.com/Japan/Tourism/Natural_places/Hokkaido/Dohoku/Wakkanai_eng.html). The “dome” seems to be very popular with travelers; there were already more than 10 tents. There is also very nice ‘Rest center with coin hot showers and laundry nearby. 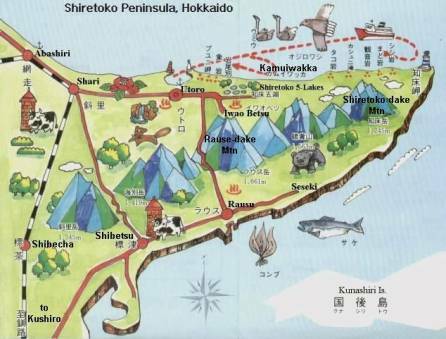 The city is the starting point for trips to Rishiri and Rebun island, also our destination. The ferry to Rishiri island (appr. 180km2) costs about 2000 yen and takes 3-4 hours?. Anyway, it is definitely worth it. The island is a green beauty with majestic Mt.Rishiri in the middle. Unlike elsewhere, camping was free and they provided us with a nice map of climbing route to the peak. After conquering the top (with beautiful views on Russian’s Sakhalin islands) we hitchhiked around the island and enjoyed its hot spring (some info and pics. from the island ? Another highlight was nearby Rebun island, known as “island of flowers”. Though main season was over (May-June), there was still plenty of blossom around to admire. Island has many hiking trails, leading to fishing villages, waterfall next to sea, lighthouse and so on). Very nice camp, a few mins. by car from the port costs 300yen. Some nice pics. ? There is also a Guest House located close to the port, right on the sea shore. It is famous for its spontaneous staff with unique approaches how to welcome guests, wake them up, cook, and so on. If you call ahead they will come to pick you up to the port. mountains to Iwao zan (still active volcano, last eruption in 1936), and camped on the ridge (campsite has steel boxes where you put your food overnight to avoid ‘bear visit’). From Iwo zan it’s few hours walk down to hot spring called Kamuiwakka. It is definitely must be experience, the jewel among the Japanese onsens. The onsen is natural ‘hot’ waterfall mixing with cold stream and creating ‘just good’ onsen temperature in the basin under it. Because its popularity and usually crowd of people, they bath in swimming suits http://www.japan-guide.com/e/e6851.html . http://www.aquariumplant.com/cart/images/items/marimo%20great.jpg). Read next website about this very special plan; http://en.wikipedia.org/wiki/Marimo. http://volcano.und.nodak.edu/vwdocs/volc_images/north_asia/akan.html. Coincidentally, our next hitchhike from the lake to Akan Kohan was again the honeymoon couple form Gifu J. Our last destination was Daisetsu-zan, the biggest NP in Japan. The starting point was Asahikawa city, which was more then 200km away from Akan. After night in Akan Kohan we caught a hike to Bikawa, little town north of Akan. Driver suddenly stopped on the way at ‘conbini’ and on our surprise he bought us a bag of onigiri and some other food. In Bihoro we hitch-hiked an old couple going back home, to neighboring city. Finally they took us another 70km further, just to drop us at very nice michi no eki (highway resting area). They also gave us their tel. number in case we couldn’t catch anything on the next day….Next day we spent ‘whole 15mins.’ trying to hike something L, incredibly long in Hokkaido J….But the driver, young girl, took us directly to Asahikawa. We left our big backpacks right at the station (just leaned against the wall, we didn’t want to spend money on storage) and went for shopping ? stocks for hiking. After 2 hours, the backpacks were still there. We took a local bus to get to the suburb (Asahikawa is big, population of 360000.) and then hitch-hiked again. Next hitch hike was a taxi, but he did not charge us (it was about 40 km to Asahi-dake Onsen, the start of trail). Daisetsu-zan, located in the middle of Hokkaido, has an area of 22000 ha and has also the highest peak in Hokkaido, Asahi-dake (2290m). There are two trails to climb the peak, through Asahi-dake Onsen or Sankyo. We chose the first one, 1100m above the sea level. Driver dropped us directly at the campsite (400yen per tent, very cheap in Japan). You can use a ropeway (700yen one way) to get to the peak, but we opted for tough 2 hours climb. From the peak there are amazing views. Our plan was to traverse along the range of the mountains to the south. The park is beautiful and while doing the traverse you can feel its huge dimension J. If you don’t believe, have a look at the next pics. http://pictures.nicolas.delerue.org/japan/200308_hokkaido/daisetsuzan/. Hopefully, you could find some handy info here. But more than that I hope I wiped off your potential worries about distance, cost and problems concerning traveling in Hokkaido. Once you can manage 2 weeks and more of holidays, you can get a lot from Hokkaido and relatively cheaply.